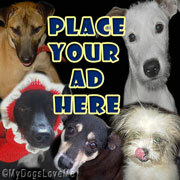 My Dogs Love Me: Dogs and Holiday Traditions, What Say You? Dogs and Holiday Traditions, What Say You? Speaking of Holidays... I know I'm supposed to talk about the Christmas Season, but I'm sure it'll be perfectly fine to just dabble a bit on the past. The Lenten Season begins on the first Wednesday of March and ends on Easter Sunday. In reality, bunnies don't poop jellybeans, nor do they leave chicken eggs behind. If they did, they'd probably have battle scars from battling for that egg. And I think with the current taxes and remittances to our social security system, it'll be hard for the rabbits to buy paint brushes because they have to take care of baby bunnies and pay for food. 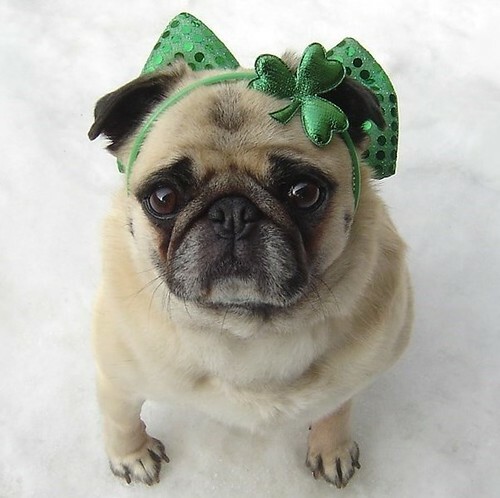 No Easter Bunnies here, just one St. Patrick's pug! Kidding aside, for devout catholics, the Lenten season means no pork, beef, or meat. Within this period, our diet is limited to all kinds of fish dishes and vegetables. Fortunately, these traditions do not affect Chooey and the pack. So it's no surprise that after eating, they end up plopping on the floor and sleeping like there's no tomorrow. You'd think they were doormat for dogs. Just out of curiosity, do you guys have a tradition like Thanksgiving, Hanukkah, and St. Patrick's Day? If so, which of these do your dogs celebrate with you?